I had a list of all the eating places I'd plan to go to but things are not always as straightforward when you're traveling with kids. There's the toilet stop and then snack stop and then more snack stop. Before you know it, they're tired. Not that I'm complaining because Lil L has been a trouper during the entire trip, walking up to 12 hours a day. This is a brutally honest review so I'm not going mince my words if the eaterie is not up to par. First up is my personal favorite. We went back twice and was planning to go back the third time but common sense prevailed and we chose a creperie instead. Pho 14 is based in Paris' Chinatown. There's always a queue outside the restaurant but don't despair, their turnaround time is quick! Their pho is definitely the best I've had in years. We had two bowls of phos, an entree and dessert for 25-28€. We were stuffed to the gills and almost enlisted a stranger's help to roll us back to our metro stop. For your information, a lot of their customers are fellow local Vietnamese. 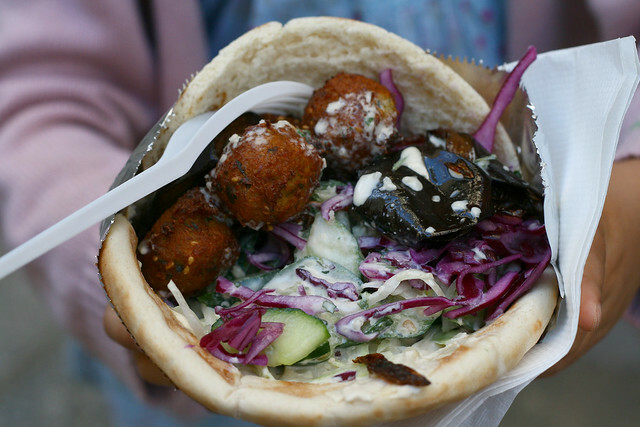 We stumbled upon this takeaway with a restaurant attached at Marais, right in the heart of the Jewish quarter. There was a queue forming so of course, I just HAD to join the line too. Their falafel was singlehandedly THE best I've ever had. It was utterly delicious and packed with so much flavor. The grilled aubergine was so darned good too. I can't remember the exact price but it was within the 5€ mark. Their customer service is rather bleh so I'd recommend takeaway which is what the locals do anyway. 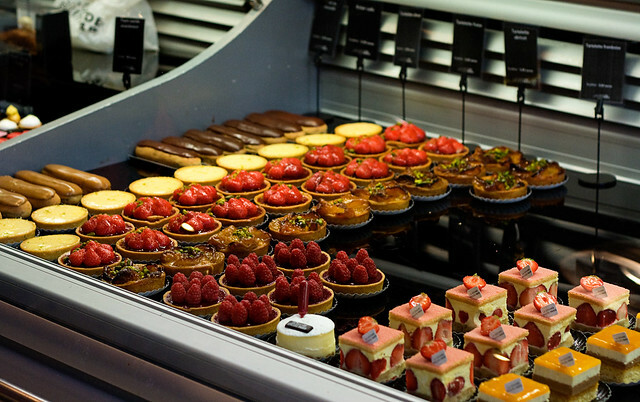 I adore this patisserie. Their croissant, pain au chocolat, apple pie and pretty much everything we'd tried were divine. The only thing that was rather so-so were their macarons. I guess I've been spoiled by Pierre Herme. If you can't be bothered going to their standalone shop, check them out at Galeries LaFayette Gourmet (closed on Sundays). They have an outlet pretty much throughout Paris. For mroe information, have a look at their website. Most people refer to the bistro as l'Entrecôte. 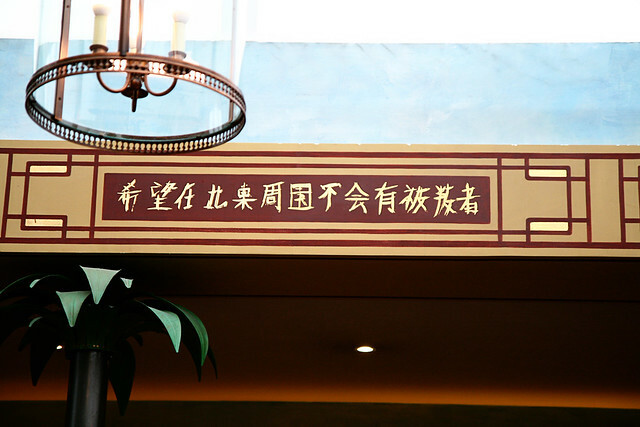 There are tons of reviews about this place on Tripadvisor and various other website. Apparently, their secret sauce which they smothered all over the steak is amazing. There's no menu so you get two servings of their steak and let's not forget the secret sauce as they like to keep reminding us as well as frites. 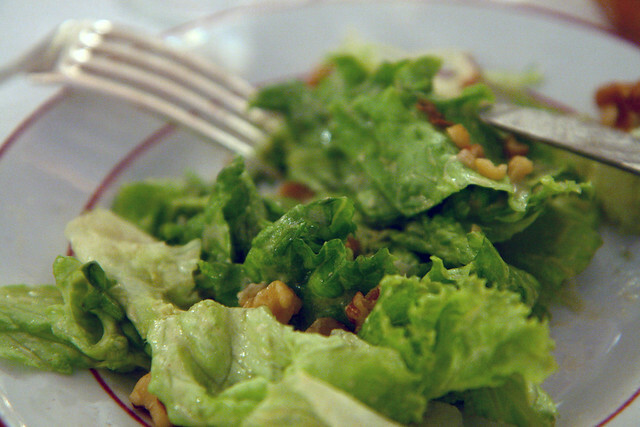 The entree is lettuce with a few pieces of walnut dumped on top and drenched in tart dressing. While hubby thought their steak was fab, I felt it was rather ordinary. In fact, I had better steak from Marks and Spencer (aged Aberdeen Angus steak). Their sauce was good but a little too rich for my liking. The frites, well.... they're comparable to frozen french fries from McCain. Fairly average meal for 25€ per head excluding dessert and drinks. There's always a long queue outside but seriously, they're better eateries out there. 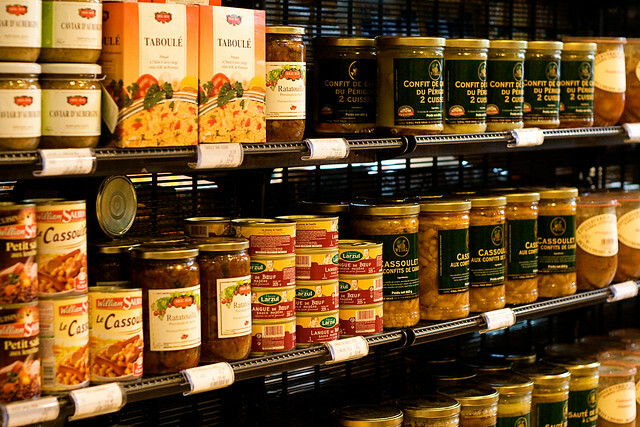 I managed to sneak a few shots in at Le Bon Marche Grand Epicerie before getting told off. 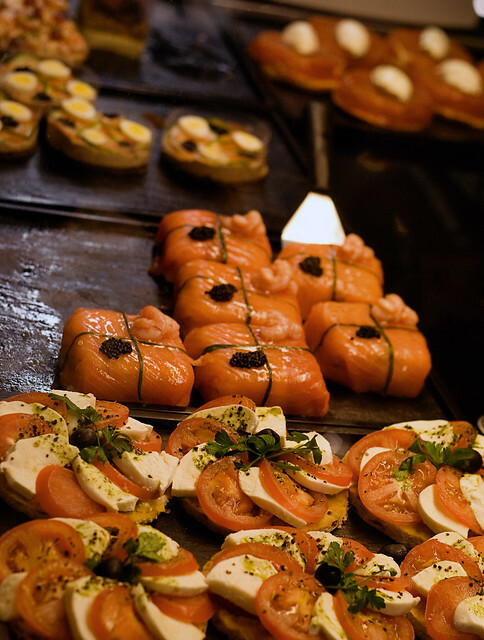 This place is a paradise to foodies. There's an amazing display of ready to eat meals, fish/beef/poultry counters, bakery and the list just goes on. I had to restrain myself from filling up the basket or else we'll have to haul the heavy grocery bags all the way back to our apartment. 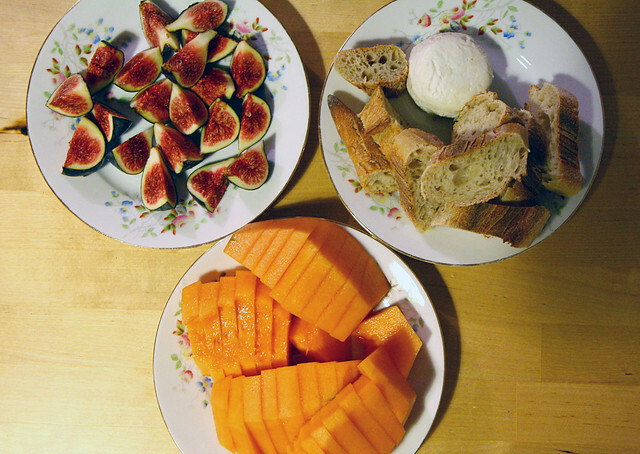 However, I managed to gather enough goodies for our dinner. 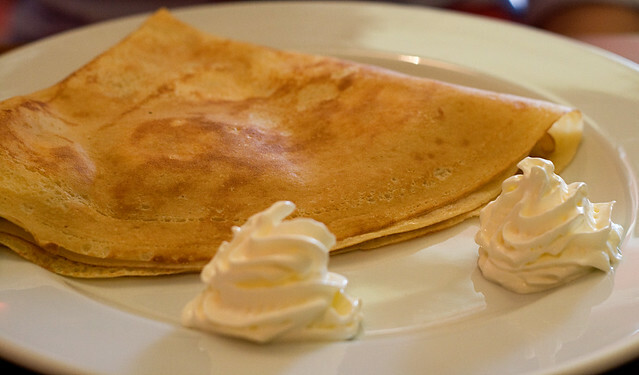 For the life of me, I can't remember how I found out about this creperie. Bear in mind I've never been here before but I passed the information to Lil L's godparents who'd eaten at Lepic Assiette on numerous occasions. They raved about this place but again, we never made it to Montmartre. 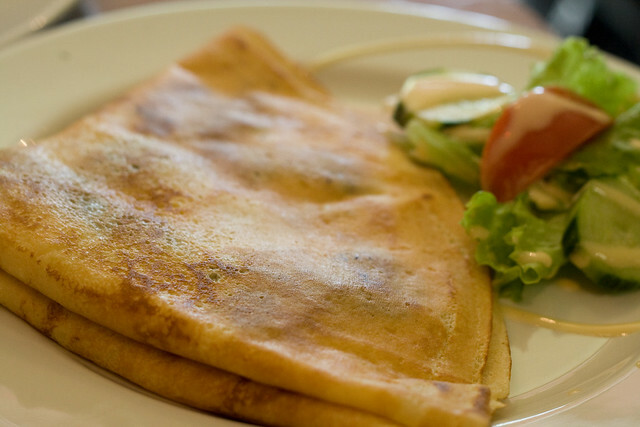 There has been a lot of favorable reviews about Lepic Assiette which essentially, is an inexpensive creperie. My friends told me that the crepe is HUGE so don't go all out crazy and order both main and dessert. I was rather bummed that we couldn't go so I popped into a local creperie overlooking Canal St Martin. It was good! At least I've ticked something on my must do list before I left Paris. These pictures are from the creperie I went to. Prices for a crepe range from 3€ to 6€. 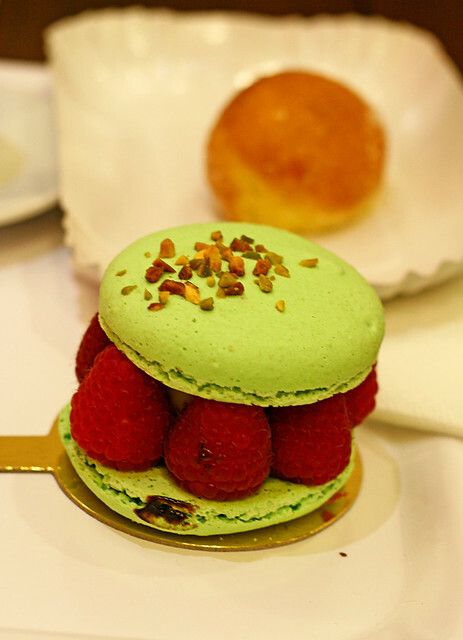 I've been to my fair share of Laduree in Paris and London but this was the first time I've set foot at their branch at St Germain des Pres. The only postive feedback I can provide is their tolerable customer service and beverages. I'll go as far as comparing their interior as a wannabe Oriental boudoir with awful chicken scratchings on the wall which looked like Chinese characters. Well, sort of. Nothing like the serene and elegant interior of the other Laduree teahouses I'd been to. As for their toilet, where do I start? Dark, dingy and DIRTY. I ordered an ice cream ispahan for Lil L. Don't be fooled by the angelic face because she flatly refused to eat anything from the ice cream bowl except the lychees. There's nothing I hate more than pay a lot of €€ for God awful food. I won't even bother with providing the address as it was that bad. Furthermore, there wasn't a single local who stepped foot into this place but it was bustling with tourists who were there just for the experience. Yum Yum. Out of all your pics, the vietnamese restaurant was the one that caught my attention. 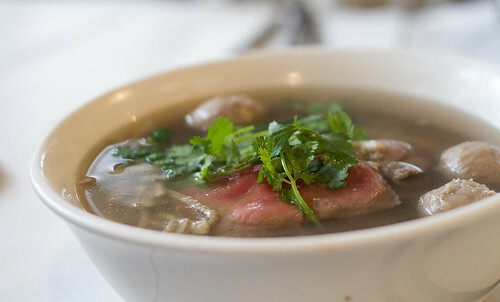 I love vietnamese food (especially pho and bun) and you have me salivating over here. Your daughter is so cute, she looks like she is really enjoying the food as well :) thanks for the post! Little L's got such an angelic face! So sayang! :) And I'm definitely heading for a pho when I go to Paris next. Thank so much for sharing! Oh gosh, is that dessert cendol? Not sure whether you like durian or not, there's a place here in Perth where you can buy durian cendol. If you like durian, it's tasted like heaven. But I would never buy it when my hb's at home. A big NO! Thank u thank u for the great list of eateries! I must print this & file it for my next trip to Paris. ;) u are making me hungry! 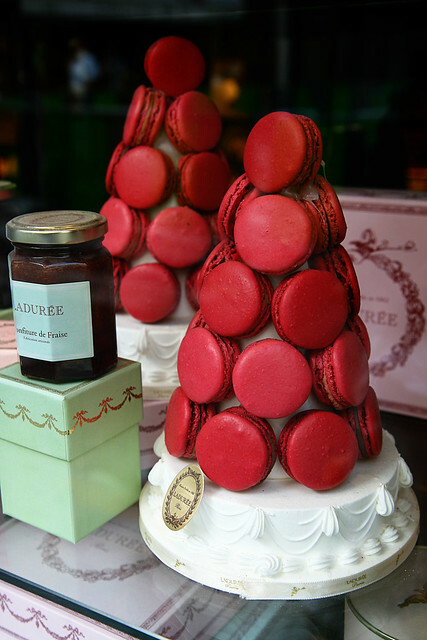 Yup - I agree about Laduree and Relais d'le Entrecote. Next time, we will have tea at the amazing Mariage Freres instead and eat more meals in Le Marais! We had delicious Jewish food just down the block from the place you had falafel! That's settled - we must stop for at least 3 days in Paris during every trip abroad!! 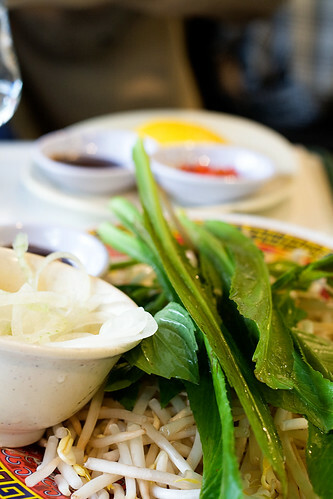 omg - I ALWAYS crave pho when I am in Paris and never know where to go - so thank you, thank you for this list! Have you had Pho in the US? Is it as good? I know in Europe it is sooo much more expensive! Sharin, out of all these restaurants, Pho 14 was my favorite. I'd go back in a heartbeat. Heather, don't be fooled! hahaha.... she's a sweetheart most of the time. You'll definitely have to go to Pho 14. 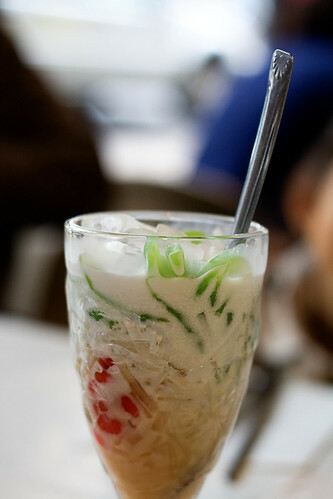 Flower, yes it's cendol. Yummy too! I'm one of those rare Sarawakians who can't bear the smell of durians. q9y8, it's also a great place for gawking at beautifully dressed Asian girls! StefPatt, I'm so glad the list is helpful. 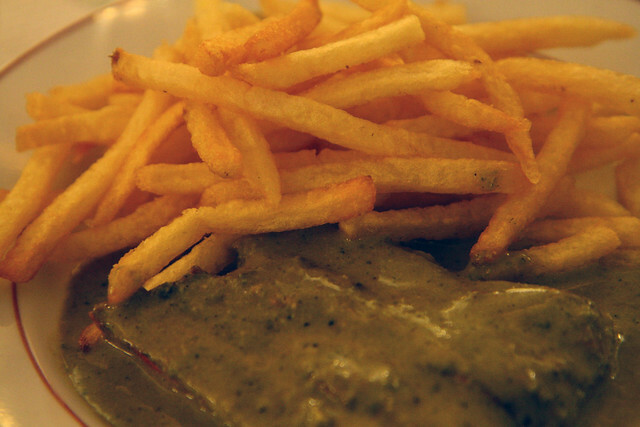 Lauraloo, Entrecote was a rip off! Mariage Freres at St Germain des Pres was closed in August. Sob! Can't wait till you get here. Kat, I'm glad you know where to go now. They're open everyday too. I haven't been back to the US for 15 years now but I had some of the best Asian cuisine in SF. You're right. It's far more expensive here. I love Pho! 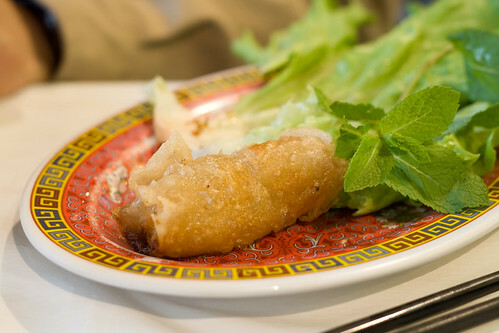 If you ever find yourself in Berlin you must try http://www.monsieurvuong.de/ it is the most popular Vietnamese. I had the best experiences there, they opened their kitchen for hungry me at 11.30pm when I arrived hungry and tired... So sweet. OK, seriously...have you ever thought about writing a travel guide? Maybe you could call it "A Fashionista's Guide to Paris" or something. I would totally buy it! ADOREEEEEE THIS POST!! 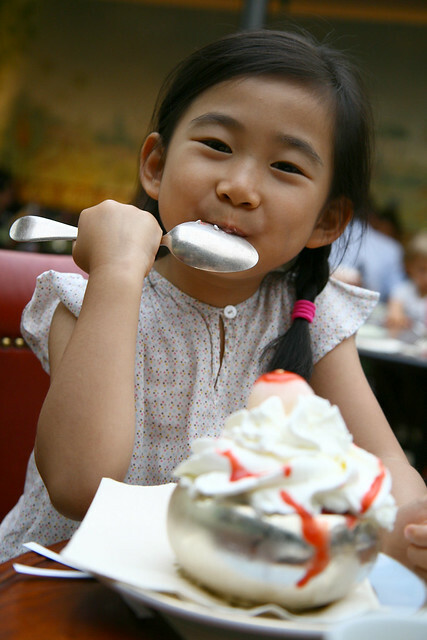 i love looking at all the yummy parisian goodies and that photo of your daughter is just ADORABLE! So sweet of you to say so, Lisa! 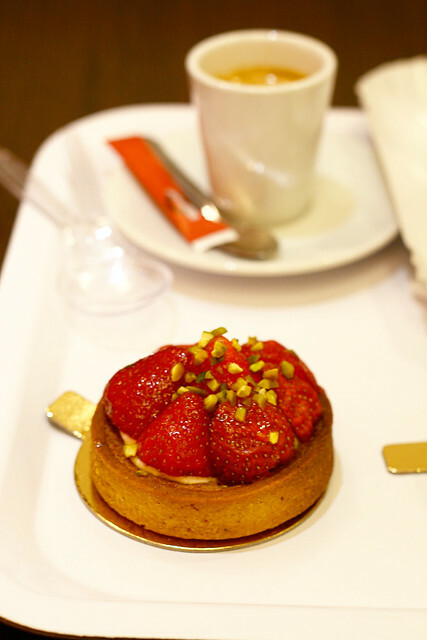 I could visit the patisseries in Paris all day, everyday.